I was very drawn to the focus on the human-animal bond in all its aspects. Diving in to learn about how our choices as a society impact the lives of all living things around us from wildlife to farm animals, laboratory animals to companion animals. I also really liked the two tracks offered which allows students to create a unique learning experience for themselves. The knowledge I gained has given me a deeper understanding of how our actions impact the welfare of animals in a variety of settings. 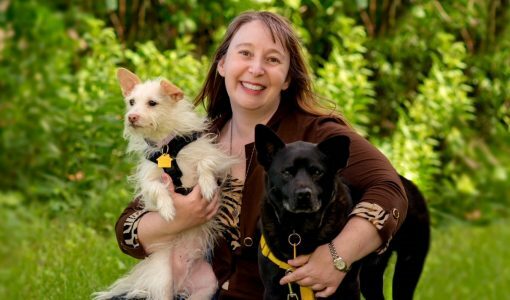 In my first position after graduating I was able to focus on animal welfare in sheltering with a focus on improving the mental wellbeing of dogs and cats in a sheltering environment. After leaving that position, I have joined the team of a trade school which trains aspiring dog trainers. Along with teaching obedience and behavior skills, this position trains the students how to engage with the humans in the family and how to improve the human-animal bond while teaching dogs how to live successfully in our human society. I chose the research track. My masters project looked at the efficacy of using ThunderShirts for extended periods of time to reduce stress-related behaviors and salivary cortisol related to chronic stress in shelter dogs. The experience was amazing, and the project went quite well. Unfortunately for my project (but great for the dogs), all but 12 dogs were adopted before they were able to complete the study and so we lacked sufficient power to have results worth publishing. But the experience of conducting the research and writing the paper was well worth it and I’m currently working on another project with my graduate advisor, Seana Dowling-Guyer. I liked a lot of aspects of the program. I liked the structure, keeping the class small and longer (2 hours) with a focus on discussion rather than just lecture. I liked the projects – both the individual as well as the group projects that encouraged creative approaches to address animal policy issues. I liked the instructors a lot! And I liked that there was some freedom to create a more individualized learning experience through the electives. Finally, the diversity of the students was nice. 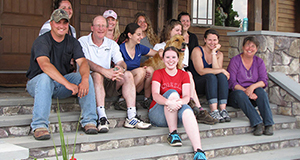 Although students came from a variety of backgrounds and life experience, we came together because of our love of animals and our desire to better understand our place in their world and how we can work to protect the balance between human needs and the needs of the other animals in our environment.